FILE: A full moon named the strawberry moon rises over New York City on June 9, 2017, in New York, NY. Strawberry moon or not, there's a reason to look up in the sky tonight. Stargazers will be able to see both Saturn and the moon on full display on Wednesday. The ringed planet will appear directly below a full moon at its brightest and closest point to Earth. June's full moon, appearing at its lowest point in the sky, has been pictured in the past giving off a light orange, yellow hue. But there is some disagreement over what tonight's moon is called, according to NASA planetary expert Gordon Johnston. The Maine Farmer's Almanac first published names of the full moons in the 1930s, naming them after what Native American tribes in the eastern U.S. had called them throughout the year. June’s full moon is usually called the Strawberry Moon, but Johnston said it is “unclear” if the names were meant to be tied to European calendar months. There will be 13 full moons in 2018 instead of one for every month, which happens about every two or three years. Johnston said it's more likely the Strawberry Moon is supposed to occur when strawberries are ripe, signaling their harvest. Despite many reports teasing this month's Strawberry Moon, his NASA blog post touted the Strawberry Moon for May's full moon. “Where I live in Virginia, the strawberries in my backyard were ripe around the time of the last full moon and are long past now,” Johnston said. So what we’ll see tonight above Saturn? The first full moon of summer—known by the Algonquin tribe as the Buck Moon, Johnston said. “Early summer is normally when the new antlers of buck deer push out of their foreheads in coatings of velvety fur,” Johnston wrote in a new blog post this week. Either way, the full moon will appear at its lowest in the sky this week, which happens every year around the time of the summer solstice. Johnston said light from the moon shines through more air, giving it "more of a reddish color." “This is especially true for the far northern latitudes of Europe," Johnston said. 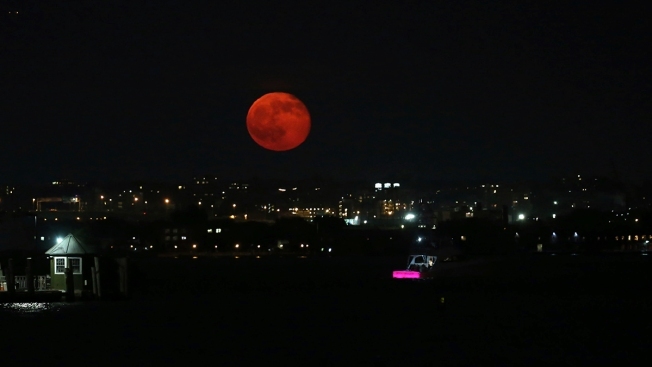 The moon will be an even deeper red, ruddy-brown color during next month's "blood moon" on July 27, which will be the longest total lunar eclipse of the 21st century, space.com reported. According to NASA, sky watchers can see Wednesday's two celestial events at their closest to each other around 11 p.m. EDT.